Expedia delivered impressive financial performance for the second quarter of 2014. There are solid reasons to believe the company will continue gaining altitude in the years ahead. Online travel agency Expedia (NASDAQ:EXPE) reported earnings for the second quarter of 2014 on July 31. Both sales and earnings were remarkably strong during the quarter, and the company continues building the foundations for sustainable growth in the years ahead. 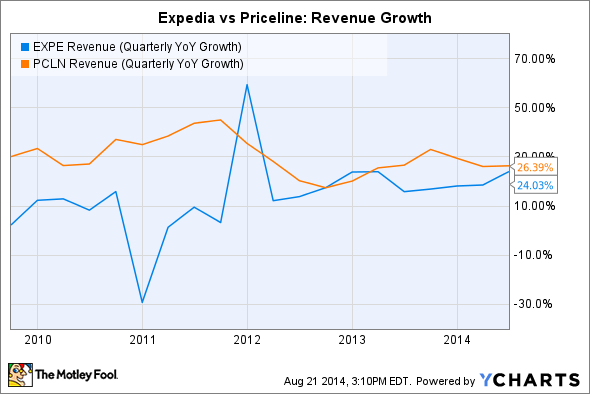 Let's take a look at Expedia's latest earnings report and what it means for investors. Sales during the quarter ended on June 30, increased by a healthy 24%, to $1.49 billion from $1.2 billion in the same quarter last year. Gross bookings, meaning the total dollar value of services booked via the platform, increased 29% year over year to $13.046 billion. Expedia has three segments: merchant, agency, and advertising and media. The merchant business model is when Expedia buys blocks of rooms and travel tickets and then resells them to customers, while in the agency division, the company allows hotels and other service providers to list their own prices, acting as an intermediary and charging a commission for every transaction. The agency model is proving to be more effective lately, and it was a big growth driver for Expedia during the second quarter. Selling and marketing expenses increased substantially in the most recent quarter, growing from $590.5 million in the second quarter of 2013 to $743.6 million, this represents a 26% annual increase and is growing faster than revenues, which means selling and marketing expenses are having a negative impact on profit margins. On the other hand, cost discipline in other areas allowed Expedia to deliver expanding profit margins at the operating level. Operating margin as a percentage of revenue came in at 8.6%, an increase versus 7.8% in the same quarter last year. Adjusted earnings per share were $1.03 during the quarter, a big jump of 61% versus the same period in 2013 and comfortably above Wall Street analysts' expectations of $0.76 per share according to data compiled by Thomson Reuters. Competitor Priceline (NASDAQ:BKNG) is the growth leader in the online travel industry. The company has traditionally focused on international markets and the agency business model, which has proven to be a winning strategy over the long term. Based on data from the second quarter of 2014, Priceline produces 86% of gross bookings in international markets and 84% of total gross bookings via the agency model. However, Expedia has been closing the gap over the last several quarters, which should come as no surprise considering that both international markets and agency sales are being important growth engines for the company. EXPE Revenue (Quarterly YoY Growth) data by YCharts. The company has consolidated its place in the business via a global network offering access to more than 325,000 accommodations around the world. Scale is a very important factor in the online travel industry, since travelers and industry operators attract each other to the most popular online travel platforms. The bigger the company gets, the more attractive the service becomes to both customers and operators. In any case, leaving competitive considerations aside, the online travel industry is providing enough opportunities for both Priceline and Expedia to deliver impressive performance, and this is a big positive when it comes to evaluating the two companies and their potential for growth over the years ahead. Expedia delivered rock-solid financial performance for the second quarter of 2014. Perhaps more important, healthy growth rates in international markets, a growing participation of agency sales in the overall business model, and a strong competitive position in the exciting online travel industry mean the company is well-positioned to continue gaining altitude over the long term.